You might remember that we bought Baby J an iPod Touch a while back. 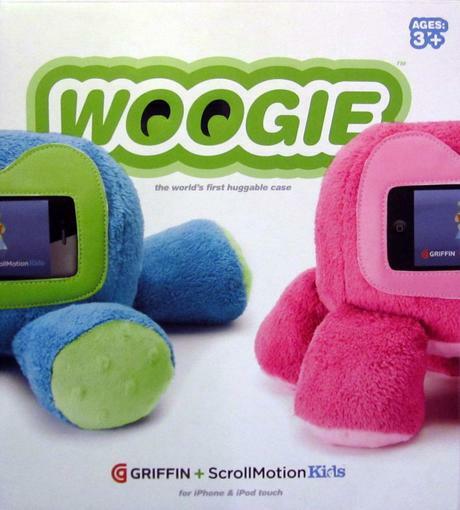 When we bought the iPod, we also bought a plush case for it: the Woogie 2. We decided on the plush case (rather than this harder case) because it was easier to get the device in and out. That kind of backfired on us because it was also easy for our six month old to get out. Downloadable app that makes the iPod have an interactive face. I could see this being fun for older children (heck, it was fun for me!). The only negative thing I have to say about the Woogie 2 is that it is extremely easy for my son to get his iPod touch out of the case. When he does this, he is able to push buttons and turn the device off, which makes for a very frustrated Mommy (we only use the iPod in the car, so I can't turn it back on without pulling over). I'm really happy with my purchase of the Woogie 2. 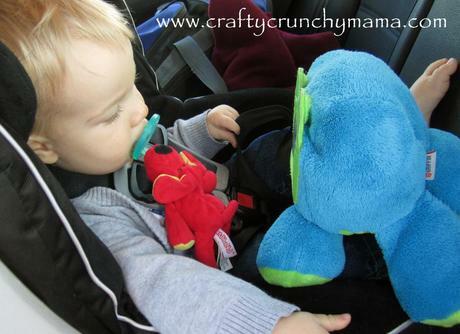 It does a great job of keeping the device safe when Baby J flings it across the car. It is fairly easy to switch apps (mostly videos in our case) while the device is still in the Woogie. I can't always navigate with ease, but most of the time taking the iPod out is not necessary. I love how Baby J can just set it on his lap and it is propped up like a little TV. We also use this case with Daddy J's HTC Incredible 2 and it works great! The only complaint I have about it is that it is so easy for a child to remove the device. This is why I added snaps to mine (check my next post for a tutorial). Baby J in the back seat of the car enjoying some Sesame Street. Do you have a Woogie or other children's iPod case? Do you like it? I would love to hear!